View More In Telescoping Ladders. 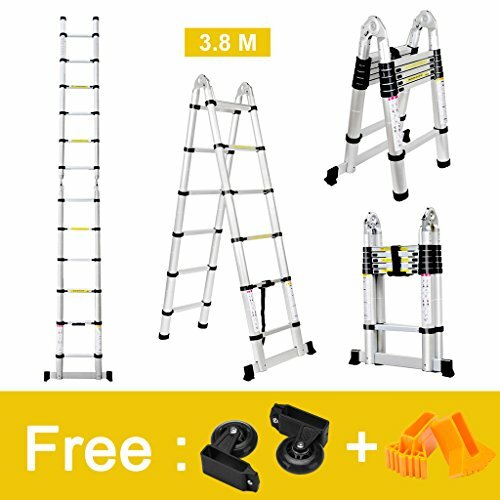 Sturdy and Convenient for use: Constructed of durable aluminum alloy and built for a maximum load of 330 lbs (150 Kg), this Finether EN131 certified 12.5 ft Multi-Purpose Folding Telescopic Aluminum A-Frame Ladder with Hinges is sturdy and tough enough to withstand the even most demanding jobs. Multi-purpose: It can work as a step ladder and a straight ladder and is ideal for both commercial use and do-it-yourself, like home/building maintenance, window washing, exterior/interior Decorating, painting, etc. Lightweight, Compact and Portable: Aluminum alloy construction makes the ladder more lightweight than those constructed of other metals. Telescoping design allows both easy movement and space-saving storage. Thanks to built-in grip handle and securing strap, the ladder can be carried anywhere with less effort, and it stores compactly in your garage or trunk without taking up much space. Safety First: Designed with safety in mind, each rung except the top and bottom rung features a pair of slide latches to lock the rungs into place before the ladder is safe to climb. In addition, the ladder has non-slip bottom caps at the end of one side and stabilizer bars with rubber pads at the end of the other that help keep it firmly in place. Easy and Flexible:The ladder is great for use in those hard-to-reach areas. It can be extended to the desired length accordingly and effortlessly. And it is also easy to retract by pushing inward slide latches of each rung except the top and bottom rung and to fold up by lifting the hinge release rod.